Last week, Jennifer Lund and I tried a new variation on our musical book tasting activity we piloted in January. Our LSTCs, Hope Black and Logan Malm, wrote a grant for a set of Chromebooks for teachers and students to use with a focus on cloud based applications and resources. After consultation with ESOL teacher Dr. Melinda Byrne, we decided to have students post to a class Padlet wall for their book tasting activity using the Chromebooks rather than the traditional paper ticket we had used with other classes. Because these classes were a little smaller than what we usually see and because these classes had used Padlet in the classroom, we felt this would be a meaningful opportunity to use the Chromebooks with students; we were also curious to see how public responses to books during the book tasting might impact student interest and engagement. 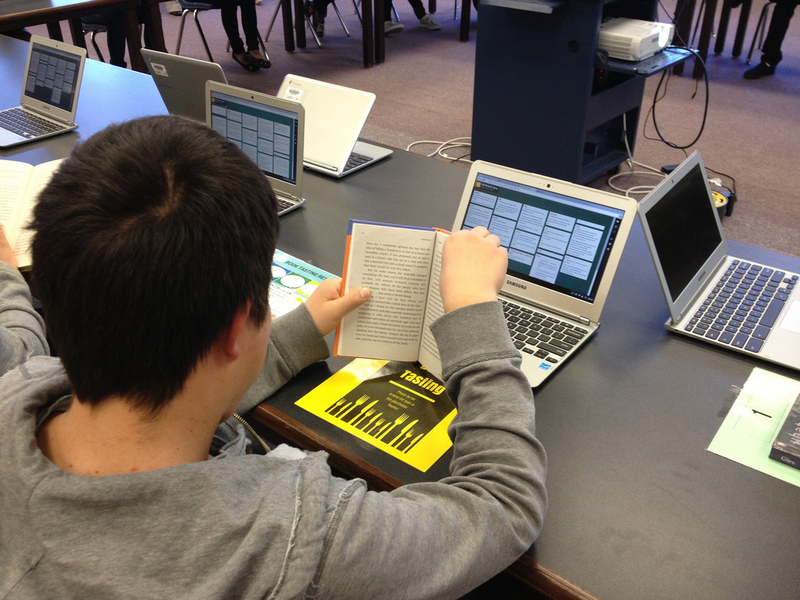 When students arrived, we helped them log into the Chromebooks and the student wireless network. 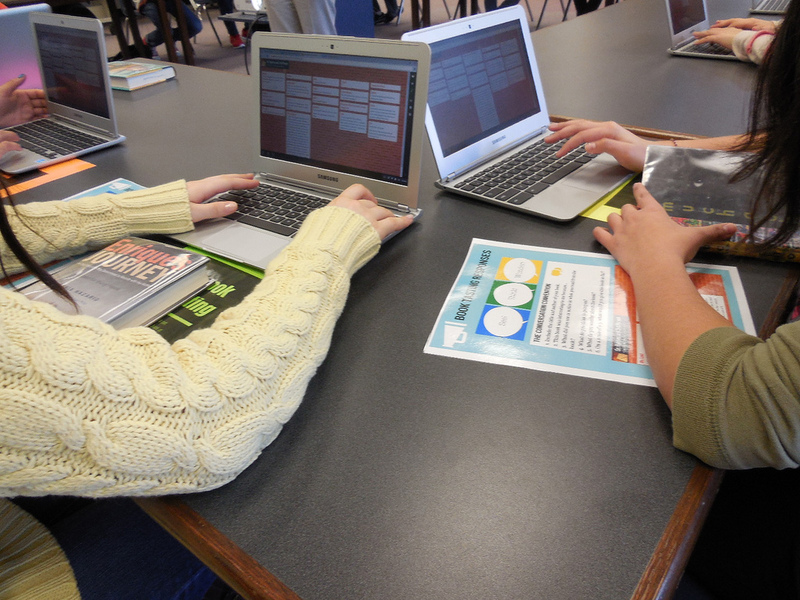 We then helped them navigate to the LibGuide for our book tasting and the Padlets we had created for each class section. Finally, we reviewed the procedures for the book responses on the Padlet and incorporated the See Think Wonder structure since these classes utilized it frequently as part of Dr. Byrne’s classroom instruction. Our initial example response was in paragraph format, but after our first class, we realized that numbering responses made more since to align with the response directions we provided students and we adjusted our examples for the subsequent classes accordingly. 1. Students seemed to take more care with their responses since they were visible to peers as opposed to private with the paper “tickets” we used. I’m always intrigued by the private/public (both positive and negative) aspects of student responses. 2. Students seemed more focused on the reading during the “reading time” and not worried about trying to complete the responses. This was such a fun day for our ESOL kids! Each student was able to “taste” a sample of several books during one class period and provide thoughts and comments about each book. 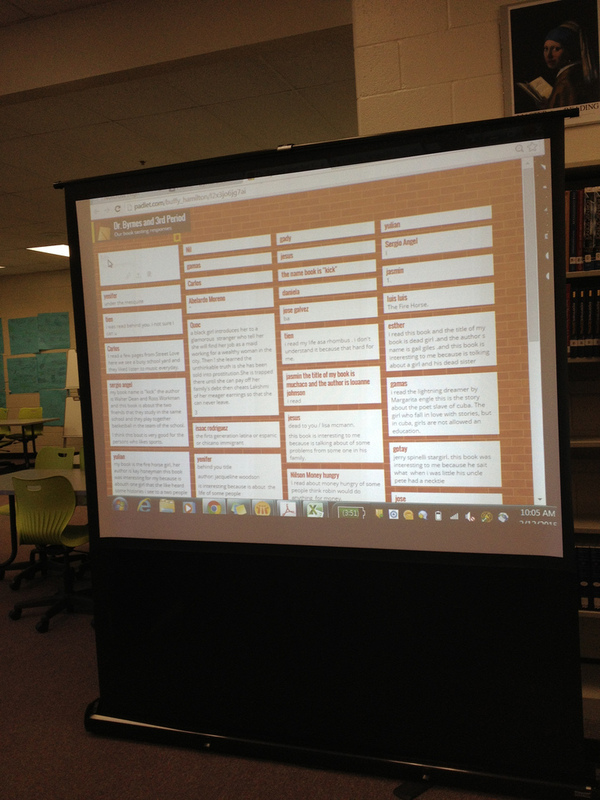 Padlet provides a great opportunity to publicly share the thoughts and ideas from EVERY student. Many times, reticent students are hesitant to speak aloud in class, but they are all comfortable responding electronically! This was a really unifying activity, and it allowed some our less vocal students to shine as brightly as those who are comfortable in the spotlight. Incorporating the See-Think-Wonder MTV routine into the exploration process took the book tasting to a higher level. The use of Chrome books was a fantastic way to ensure that all students were able to have a positive and engaging experience during the book tasting. Many of my students don’t have cell phones, so activities that incorporate individual cell phone responses alienate a portion of my student population. Using Chrome books allowed for full participation. One of the terrific elements of Padlet is the ability to export the responses in multiple formats; whether you are using the Padlet responses as a formative or summative assessment, the ability to archive student work is a tremendous asset, particularly if you are looking at student growth over time. The only challenge we encountered was with the log-in process with the Chromebooks. Because we are not a Google Education school at this time, we are not able to do the simple one-step process. The alternate procedure for logging in students and connecting them to the student wireless network, while not difficult, does involve several mouseclicks than can be potentially confusing for students, especially those new to the Chromebooks. Aside from that, the Chromebooks worked beautifully, and we’re excited to explore other ways to utilize these as mediums for learning with our teachers and students. A heartfelt thank you to Dr. Byrne and all her students for such a terrific day—their enthusiasm is truly energizing! We also are grateful to our colleagues Hope and Logan for helping us facilitate the activity and their support of learning in multiple formats. I’m going to be doing this activity with two freshman English classes next week. We don’t have laptops or Chromebooks for them to use, though, so we’ll have them log on to the computers in the LMC and in the adjacent computer lab and go the Padlet page at the start of the period. Then they’ll walk around the tables and go back to their computers to make their Padlet post. It’s not an ideal situation, but I’m a big fan of going paperless as much as possible, and I think the kids will like using Padlet since no one in my school has ever used it before. I used it in my previous school. I just mentioned it to a few of the kids in the class and they are excited about it.